Lean-Eating Sampler Count on us to deliver your lean-eating New Year solutions brimming with the flavor you love. 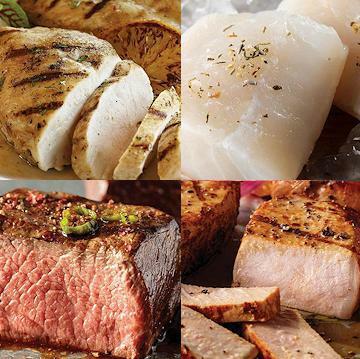 This sampler is loaded with naturally lean options perfectly prepared by America's Original Butcher: thick pork chops, succulent chicken, naturally lean Top Sirloins and Filet Mignon - made extra-lean through careful trimming by our master butchers - and heart-healthy Icelandic Cod. Order the Lean-Eating Sampler today and get a FREE Contact Grill! This counter-top grill is the perfect way to enjoy great, grilled food no matter the weather. Order with complete confidence today, every ounce is 100% guaranteed to satisfy! Aged at least 21 days for maximum tenderness. Cut from hand-selected premium beef tenderloin. Flash-frozen and individually sealed for perfection. Trimmed by hand - some exterior fat. FROM THAWED: Oven: Preheat oven to 400�F. Place thawed Cod portions on a baking sheet lined with foil or parchment paper. Bake for 12-14 minutes. Optional: Lightly season cod with olive oil, sea salt and fresh lemon juice prior to placing in oven. FROM FROZEN: Oven: Preheat oven to 400�F. Place frozen Cod portions on a baking sheet lined with foil or parchment paper. Bake for 25-27 minutes. Optional: Lightly season cod with olive oil, sea salt and fresh lemon juice prior to placing in oven. Uncooked: For safety, must be cooked to an internal temperature of 165 � F as measured by use of a thermometer. Thaw in Refrigerator. Broil or Grill: Preheat broiler or grill. Cook for 3-4 minutes per side until internal temperature is 165�F. Contact Grill: Grill 3-4 minutes total on preheated contact grill or until an internal temperature of 165�F is reached. Oven: Preheat oven to 350 �F. Season as desired. Place chicken breasts in greased baking dish. Bake for 20-25 minutes or until an internal temperature of 165�F is reached. Pan Saut�: Place 1 Tbsp. of cooking oil in a nonstick skillet over medium high heat. Add chicken breasts to pan. Cook for 4-6 minutes per side reducing heat to medium after flipping. Cook to an Internal temperature of 165�F.